1. Why use ConnectCode Barcode Software? Industry Specifications Adherence - ConnectCode Barcode Fonts has been created and tested vigorously by a team with many years of experience in the Auto-ID and IT industry. It takes into consideration all the above mentioned properties and is definitely one of the best barcode font around. Simplicity and Ease of Use - The fonts package has been designed in such a way that a user can even specify a barcode by keying in the characters directly as much as possible. 2. Why should I use your barcode software instead of your competitors? We have developed and marketed barcode software solutions for many years. Our barcode software is trusted and highly regarded by many fortune 500 companies. We have also helped many fortune 500 companies clear their institution audits and independent barcode verifications. These are vigorous tests and require both expertise and experience. With each test, our products improve in terms of quality and stability. As a matter-of-fact, most of our customers are very happy and very satisfied with our products. They have also been with us for many years. 3. Why do I see text characters instead of barcode after copying the barcode to TextEdit? It is likely that the barcode fonts are not installed on your system for sharing. Please refer to the section on "Setting up the barcode fonts for other Applications" to setup the fonts. 4. I am getting an extra digit in my barcode. How do I turn it off? This is the check digit/character of the barcode. For some barcodes this character is optional and can be turned off. If you are using ConnectCode Barcode Software, uncheck the Check Digit option. If the option is grey out, it means the specific barcode does not support check character or the check character is mandatory under industry specifications. If you are using Excel formulas, set the second parameter (typically) to "0" to turn off the check digit. To turn on the check character, set the second parameter to "1". If the check character parameter is not specified, the Excel formulas will default to the recommended industry specification of the barcode. 5. How do I create an Extended Style UPC/EAN barcode that appears in a retail packaging in Excel? Please see the section "Creating barcodes in Microsoft Office for MAC" on importing the barcode formulas to Excel. The "1" in the second parameter indicates the generation of an Extended Style EAN13 barcodes with Embedded Human Readable Text. 6. I noticed that you have both OS X and macOS versions of the barcode software. When I purchased from your Web Store, will I be getting the OS X version or macOS version? 7. I have recently upgraded to macOS from OS X. How can I upgrade ConnectCode Barcode Software? a. If you are using a version of ConnectCode Barcode Software (OS X 10.6-10.11) purchased from our web store, please contact us at support@connectcode.net with your Order No. for your free upgrade. b. If you are using a version of ConnectCode Software from the Mac App Store, you will be prompted to upgrade by Apple App Store. 8. Important Notes on upgrading ConnectCode Barcode Software from the previous version to the latest macOS (and beyond). ConnectCode Barcode Software uses fonts to generate barcodes and is dependent on the OS character encoding. On OS X (10.6-10.11), our software uses the Mac OS Roman character encoding. On macOS (Sierra or onwards) our software uses the UTF-8 character encoding. a. 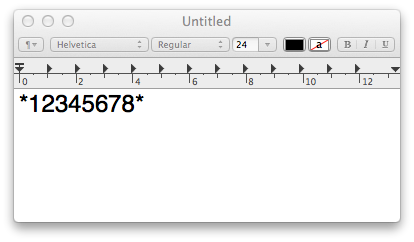 If you are running macOS, please make sure you use the fonts, encoder, command line tools, Excel formulas and AppleScript from the ConnectCode Barcode Software macOS version. Using previous barcode fonts (from our OS X version) with the latest macOS Encoder etc. may result in incorrect barcodes. b. If you have previously generated a barcode from our OS X version and pasted the barcode characters into Adobe Illustrator/InDesign, please regenerate the barcode, after upgrading to macOS, using the new Barcode Encoder and paste the new characters into Adobe Illustrator/InDesign. Please also remember to use the new set of fonts provided, especially if you have copied the previous fonts to your ~/Library/Fonts folder. The source code of ConnectCode Animator will be made available on this website with the official launch of ConnectCode Animator Version 1.0. What kind of Open Source License do you use? The source code of the software written by us uses the Microsoft Reciprocal License (Ms-RL) which is certified by the OSI (Open Source Initiative). Our software also uses source code with licenses mentioned in the Attribution of our website. When will the Documentation be available? The documentation of ConnectCode Animator will be made available with the official launch of ConnectCode Animator Version 1.0. Yes. You can upload the files generated by the software to a commercial website or use the output in your company/customers' projects. You can also charge for the work you created using our software. A link to our website will be appreciated but is not strictly required. Can I redistribute your software? Yes. If you need an email confirmation from us, simply drop us a note at support@connectcode.net. Microsoft Silverlight is a platform for enabling Rich Internet Applications. It is a web browser plugin supporting programmable features like vector graphics, audio, video and animation. More information can be found here.